I'm making potatoe latkes and minestrone to honor both my family traditions. 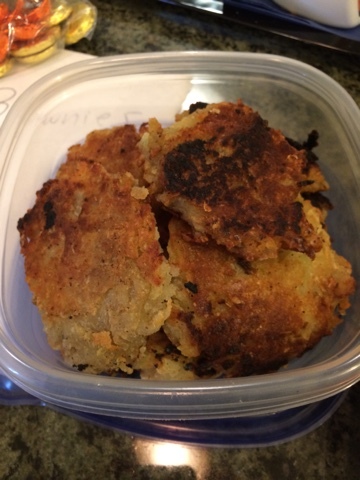 Here's latkes without egg or wheat or dairy. And I use Glutino cake and cookie mix to thicken. Or their muffin mix. Mix with hands and fry in hot oil-- olive oil for me-- on medium. And try not to " taste test " them all. The minestrone recipe is in my cookbook. Happy and healthy and hopeful New Year to all! Happy Merry everything. And a safe and prosperous and hopeful new year to all. I love this time of year. I live in a cold climate and the snow can be beautiful ( especially since I'm not traveling) and the smell of pine wafts through the air as the Christmas tree sellers set up on the sidewalks. It's taken a while for me to relax into this season-- which often centers on traditional foods and recipes. And almost ALL of those family dishes are not safe for my son. My family. The feast of the seven fishes-- well. No fish or shellfish. How about "timpana" the italian potato and cheese soufflé. Nope: eggs and cheese. Let's see-- what about Marzipan: absolutely not-- no almonds or nuts of any kind. And while it took some time for me to not miss the foods I grew up with, I did realize finally that it was okay to mourn that part of my past I'd given up. It may sound silly to feel like my history is so wrapped up in traditional meals or foods. But it is. And I might as well acknowledge it. And move on. And move on I have. Now we have beef tenderloin for Christmas Day. And, minestrone or slow-cooked pork shoulder for Christmas Eve. And delicious brownies and sorbet for dessert. Happy Christmas and a wonderful new year to all. We'll scale the heights and grapple with the lows of everything teen-aged and food allergy. Restaurants. Dating. Travel. Sports. College. Parents. (!) Epi-pens and risk taking. And we'll laugh and I'll cry-- I always do-- and we'll make new friends and catch up with old ones. And we'll watch as our strong, brave, and wonderful kids have a blast. Strange title , I know. My kid can't eat that!-- and lots of others can't either. It's loaded with at least three of the top allergens: Dairy. Egg. Wheat. No mention of that possibility. And the article went on to discuss restaurants where, while they serve boiled peanuts-- the city specialty, the servers were conscious of nut allergies. And, also, some of the desserts are made with nut flours, but they're kept separate from the other flours. I emailed the founder of this website, noting that many families -- mine included --wouldn't be comfortable with that level of possible peanut contamination. And our mentors at FARE and other resources reiterate: try to stay away from places with likely cross contamination. And, I further told the founder that since the site discussed largely peanut allergens--with a nod to gluten free, I didn't find it very helpful. Many families contend with more than peanuts. The response to my email was that the information was general and that the founders were hoping to develop an app that families could customize for their personal allergens. Where's the community in that? I want to share: Best practices. Information. Experiences. I think that's as important as a " customized app" for one family. And I treasure my food allergy community, those people who help me get from A to Z and skip Eggs inbetween. Chickpea Juice as Egg Substitute??? Trigger warning: I'm a little peevish in this post. When I opened the FOOD section of the New York Times May 11, was I the only person who hadn't heard of this new trick of using chickpea juice as an egg? This new trick-- made into an industry by its discoverer or inventor, whichever you choose to call him, Goose Wohlt-- and others working in the vegan marketplace. Sounds great. AcquaFaba Named from the Latin meaning water +bean. So it whips into meringues, it thickens and binds in baking, it works well in a whiskey sour, and it can leap off tall buildings at a single bound. No, wait-- that's Superman. However, never once, not even in passing, was food allergy mentioned. Veganism, yes. The mixtures we have all tried for egg substitutes: baking powder and vinegar;egg replacers ( my favorite is EnerG) were all noted. But this discovery grew out of a man looking for a good substitute for eggs because he is a vegan-- and a "tinkerer." Obviously veganism is bigger news-- possibly bigger business?-- than food allergy. I'm happy, maybe I can try this in my recipes. Maybe the food allergy community at large did know about this innovation-- IF IF IF you're not allergic to chickpeas, which many folks are. Is food allergy not mentioned here-- rarely, if ever, mentioned in food sections-- because people don't believe it's real? Are we "too niche" to be included? What is going on here-- not even a throwaway mention? So, I will write to the NYTimes FOOD editor and note that there are 15 million of us eager consumers out there who could have at least been mentioned when egg substitutes are touted and revealed. And, I will mention that we food allergy folks have experts in the field who could have given opinions or commentary. And, the story could have been broadened by out many "war stories"of substitution and triumph with egg. "That," as my mother used to say, 'and a nickel will get you on the subway." Warned you I was peevish. Lately, I've been enjoying the luxury of not thinking about food. Making it, shopping for it, worrying about it. I am finally "Letting go. " not that I worried when my son lived in another city-- I didn't. I trusted him to do right by himself. And shop, cook and eat properly. He was saying, "Mom, I'll take care of it." Well, after a few stand offs, I realized I was I was being foolish and a helicopter mom: he could take care of it, especially if I stepped out of the way. If we're off for the weekend, I don't stock the fridge for him-- you get the picture. But it's tough, stepping away, letting him be independent. After so many years of planning and asking and checking and cooking. But, I am stepping away and I am enjoying the extra time and even more so: I am enjoying seeing my son live so successfully on his own, without my misplaced "assistance" holding him back. Easter Greetings, and a picture of the cookbook! Happy Easter all-- I just vetted the menu, with really no substitutions, for our Easter meal with friends. Our chocolate and jelly beans are from Vermont NutFree, and the weather looks decent-- what more can I ask! Buona Pasqua, as we say in Italian. · Daredevil: If I can make delicious wheat free, egg free, dairy fee, nut free cake, then I can do anything! · Hostess: All the parties are at my house! · Vanguard: My son and I now see challenges as opportunities to grow. · Colonizer: We’ve built friendships across state lines and ages and allergy lists. · Fortune Teller: My son—and your kids—will be people who get things done, who command respect, who lead--not follow. 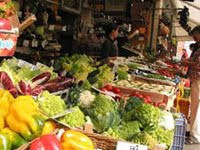 · Pilgrim: My family maintains a nutritionally sound diet with lots of fresh foods. · Crusader: I get to educate people—informally & formally—about keeping people with food allergies safe and happy. · Mythbuster: Sometimes lemons really DO make delicious lemonade! So we're back from Cuba and I have been thinking about the food-- which was delicious. There are many items that seemed safe== and there were many items that were not safe. Many dishes in Cuba are shellfish and seafood-- it is an island after all. These dishes-- many of which I tasted-- were delicious and served family-style to tables. Not that the lobsters and shrimp were served with the white flat fish ( like monk fish or snapper) or served with the chicken dishes. But that separation was at the table-- what happened in the kitchen? Because as Americans we have not had a lot of communication back and forth with Cuba and Cubans, although their medical system produces many extremely well-trained doctors and medical personnel, I have no clue if Cuba is aware of food allergies or not. Looking on the internet gleaned me nothing on statistics or even research data-- again, because I think our countries were not exchanging information of this sort. Even searching the FARE website comes up with nothing on "CUBA." But back to the food: We did encounter peanuts as bar snacks-- like in US bars-- although very little food included peanuts as a visible ingredient. A couple of times, we saw almond slivers. Cheese did not cover dishes, nor seem to be hiding in the mix-- there were lots of stewed dishes-- pork with tomatoes or lamb or shredded beef-- mostly with tomatoes and onions and peppers, not cheese. I think soy is relatively unheard of in this country which imports much of its food and relies on basics. We saw lots of the same ingredients mixed in different ways: peppers, eggplant, onions, chicken, lobster and shrimp, pork. at some of the more elite restaurants, we sauce a cream sauce or two. I initially thought, this would be ok for people with food allergies, but as I spent a little more time, I did become wary-- also, I don't speak Spanish, that would help since the Cuban people we met were highly educated and well-read, and willing to help us for any reason. 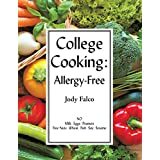 However-- completely in another vein:, I kept thinking: IF there are no food allergies, big 'if', or a low low incidence of food allergies-- why? many other countries seem to have an increasing incidence of food allergy-- including the US-- why would this island which has been relatively isolated since 1959 have a low or non-existent level of food allergy? A question I will pursue, since it seems Cuba, if food allergies are really low, could afford a "control group" possibly, in a natural experiment, for researchers to investigate. Amazing place for contrasts and history and absolutely lovely and very cultured people. And the food-- surprisingly, if you eliminate the lobster and exotic fruits, there are very few allergen laden foods. Much roasted chicken and pork. Peppers and onions. And not cheese over everything or in foods. I was happily surprised. Lots of rice and beans-- deliciously prepared in many fashions as well as chickpeas and canned asparagus! So it's not a complete-- off-the-list place. I've been saying it all along!!!! Ritz Crackers now have a TV commercial that ends:" what's on the table is never as important as who's around it. " I've been saying that for years! You're probably all sick of hearing it! But, hey, it's true. So I guess now everyone, not only our food allergic community, knows it. 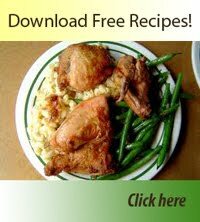 And don't forget the Cookbook-- thanks. You can check out the link below or on the right hand side of the full site. One of those weeks where everyone's home for dinner every night-- and you're scratching your head about what to cook. It's a new year, so why not try something new. It's cold, so you want something cozy and homey. 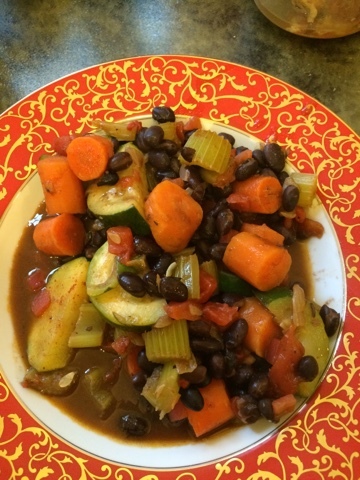 I already made minestrone this week--Now what? So out come the cookbooks. But the more I looked at the books the more I became convinced that not everything needs a dollop of cream or a coating that is dipped in egg. That's usually the food allergic family dilemma. Too any substitutions. And last night it got to me-- my mind went blank and I couldn't think what to cook for any future dinner much less tonight's dinner. But apply it to dinner: how many ways to use the foods my kid CAN EAT and is NOT allergic to??? Many ways-- and none required breaking a window. So we had chicken thigh stew with red beans, celery and ham ( or spicy sausage if you want). And the next night, meat soup-- diced carrots, celery, shin beef and peas. And the next night, a roasted oven-stuffer with garlic and parsley and olive oil under the skin and lemons and carrots in the cavity-- and since the oven was on: cauliflower with sliced Granny Smith apples and yellow raisens. Of course the list could go on and on: the point is to think about what we CAN COOK, CAN EAT and have creative fun with those foods-- and forget about the rest! Bear with me: The blog has been acting a little funny-- so you may have gotten some posts twice-- and the online blog didn't update. So here goes again. My new year's resolution is to use a little less oil and a lot more chicken. 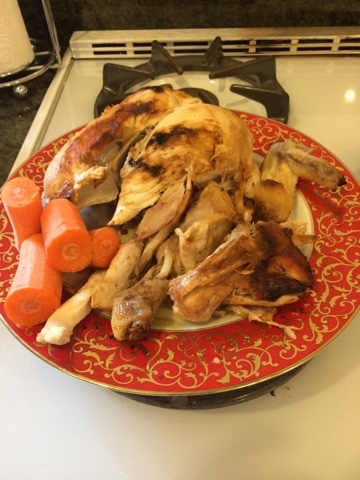 Yesterday, I got a chicken, cut up into pieces, and put it in a roasting pan. I took a can of diced tomatoes and spooned them over the chicken-- without the liquid, makes it too watery, Then I diced 3-4 cloves of garlic and sprinkled them over the chicken and tomatoes. And, of course, I added lots of pepper. Pop it in the oven at 400 covered with tin foil and let it cook for 40 minutes. Then removed the tin foil, stirred a bit, and cooked for another 30-40 minutes until nice and bubbly. I served this with rice, and since the over was on, I roasted Brussel sprouts (halved with a Tablespoon of oil and some water). Easy and delicious-- and a pretty healthy way to start the new year.